The Bully Game: Stop Picking On Me – Published by Connie Coyote. Aimed at getting bullies to change their behavior and victims to stand up to their abuser. Bullies Victims and Bystanders – Published by Didax. Intended to be used after a bullying incident within an educational framework. Play-2-Learn Dominoes: Bully Wise – Published by Franklin Learning Systems. Dominoes, but before you get to play your tile, you have to answer or act out something on a picked card. They also publish other anti-bullying board games. 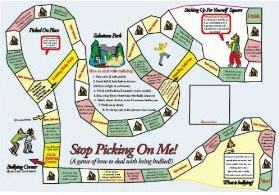 Bully no More Scenarios – Role play scenarios from Bully No More, which lists a dozen similar games. No More Bullies – Published by Impact Publications. Players create a puzzle during the game that transform a bully into a nice guy, but otherwise aimed at getting bullies to change their behavior and victims to stand up to their abuser. An organization called Bullywatch created its own game. Scroll down. A Top Trumps game called Fire Within, created by a young boy who was a bully victim.